Emory University is taking steps to eliminate the use of neonicotinoid-based pesticides and pre-treated plants on its campus grounds. Photo by Dave Fisher. In response to declining global bee populations and environmental threats to other pollinators, Emory University is taking steps to eliminate the use of neonicotinoid-based pesticides and pre-treated plants on its campus grounds. This week, Emory's Office of Sustainability Initiatives released a new campus pollinator protection commitment grounded in the philosophy that "protecting pollinators will further Emory's sustainability vision to help restore the global ecosystem, foster healthy living, and reduce the university's impact on the local environment," says Ciannat Howett, director of the Office of Sustainability Initiatives. Howett also cited the critical role that pollinators play in ensuring a secure food supply as a major reason for taking action. "Many people don't realize that two-thirds of the foods humans eat every day require bees and other pollinators to successfully produce a crop," Howett says. Purchase plants for campus landscaping that have not been pre-treated with neonicotinoids, to the extent feasible. Current nursery suppliers have indicated that they do not pre-treat with neonicotinoid pesticides. 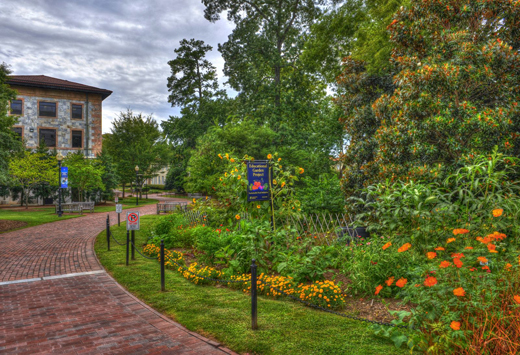 Specify in contracts with vendors and in campus construction standards that neonicotinoids or plants pre-treated with neonicotinoids may not be used on Emory's campus, to the extent feasible. Ensure any substitutes for neonicotinoids used on campus are safer for pollinators. Plant and maintain pollinator-friendly habitats on campus. Conduct campus outreach and education on the importance of pollinators. Now considered the most commonly used class of insecticides on Earth, neonicotinoids have been linked to wide-scale bee decline and impacts to other pollinator species by a range of scientific studies, according to bee biologist Berry Brosi, an assistant professor of environmental studies at Emory and a lead author for the Global Assessment of Pollinators, Pollination and Food Production for the Intergovernmental Platform for Biodiversity and Ecosystem Services, established by the United Nations. "Neonicotinoids are known to kill bees and other insect pollinators in very low doses, and to cause behavioral disruptions in even minute concentrations, measured in parts-per-billion," explains Brosi. Studies have also shown that they can affect other species, including birds, he adds. And while many factors are influencing bee decline, including habitat loss and honey bee diseases, Brosi notes that those are issues Emory can't influence. "But it is great that they are acting on the one element they can do something about — reducing pollinator exposure to harmful insecticides," he says. Neonicotinoids can be found in a variety of readily available garden products, as well as greenhouse-grown ornamental plants, which are frequently pre-treated with the pesticides before being marketed in commercial nurseries, according to Brosi. A review of pesticides used on campus conducted in tandem by Emory grounds employees and the Office of Sustainability Initiatives revealed that the university had been using only two products containing neonicotinoids for very specific applications — one for fire ants and the second for a pest that can appear on boxwood plants. However, neither product was broadly dispersed and both have been replaced by products researchers have deemed safer for pollinators, according to Howett. Efforts to protect pollinators have emerged as a growing national concern, as individuals and communities have recognized the crucial role pollinators play within the ecosystem, including the production of food crops and propagation of wild plants, Howett says. At Emory, "we had begun talking about the issue and were interested in knowing if there was anything we could do to protect pollinators," she says. In April, Howett heard from the Atlanta-based Turner Foundation, an organization dedicated to protecting and restoring the natural world, with a report released by the Pesticide Research Institute, Turner Environmental Law Clinic and Friends of the Earth (FOE U.S.), a network of grassroots environmental organizations, and others, showing that many nursery plants being sold as "bee-friendly" are actually pre-treated with neonicotinoid pesticides. "As this body of science grows, demonstrating a clear connection of 'neonics' to either killing bees outright or impairing their ability to do their duties, we're hearing from more universities saying, 'How can we help?'" says Tiffany Finc-Haynes, FOE food futures campaigner. In developing the pollinator protection commitment, Jimmy Powell, director of engineering and exterior services for the Division of Campus Services, contacted Emory's plant nursery supplier "to confirm that they do not pre-treat plants with neonicotinoid pesticides," says Howett, whose office has also developed outreach and educational materials on the issue. "With Jimmy's help, we were pleased to see that we were actually in pretty good shape," she adds. "This was a commitment that we could make without having to implement major changes to our operation."